You're probably family with the widespread claims that The Wizard of Oz synchs up with Pink Floyd's Dark Side of the Moon. 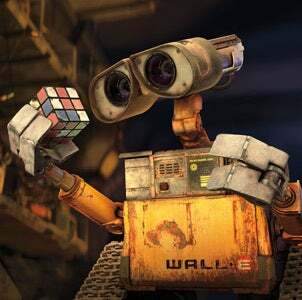 Now some fans are saying the same is true of robot love story Wall-E and The Wall. 2:58 "drop it on them" he pulls it out in perfect time of the word "them"
4:40 Walle gets new treads and camera change is perfect for the word "skating"
5:07 screen opens to show WALLE's on the word "feet"
5:13 The ship AXIOM on the word "mind"
I'm not sure whether I should be more surprised that these coincidences occur with not one, but at least two Pink Floyd albums or that there are multiple people who synch Pink Floyd up to random movies just to see what happens.